No one was harmed in this incident, no shots were fired, and the officers did not use force, at least not more than necessary to take a 90-year-old woman into custody. Nor is anyone going to press charges, according to the report. The sole reason to mention this case is to question why a SWAT team was summoned at all. This happened in Channelview, Texas, a suburb of Houston that may be most famous for the case in which a woman tried to hire a hit man to help ensure her daughter would make the cheerleading squad. The "channel" it views is the Houston Ship Channel, and according to the report the woman is upset because a barge company has bought up the land around her house (she refuses to sell out) and has been doing a lot of construction lately. 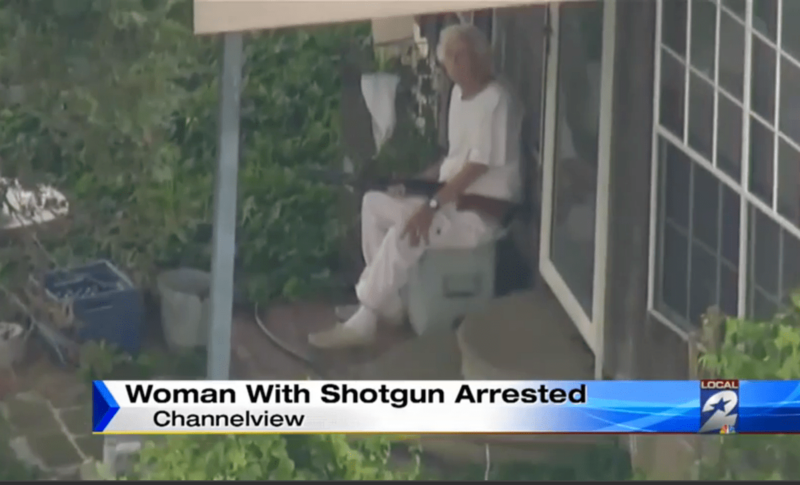 On July 30, construction workers called 911 to say that the woman was threatening them with a shotgun. Again. The workers told deputies that she has "pointed weapons at them before" several times and they didn't say anything about it. This time, "they felt she was much more angry." When deputies arrived, she refused to put down the gun. So then they had themselves a standoff, albeit a standoff with a 90-year-old great-grandmother in her jammies. A police sergeant "engaged her in conversation while the SWAT team deployed around her house." All told the standoff lasted about four hours. Eventually she did put the gun down, and at some point SWAT officers took the opportunity to rush the porch and grab her. The report says that "officers appeared to handle [the woman] with great care." So again, this is not about police roughing up an old lady. It's to puzzle over why a SWAT team was called in at all. I don't know how many deputies they had there, but it was almost certainly enough to overpower a 90-year-old woman if absolutely necessary. If they needed more deputies, they could call more deputies. In the unlikely event she opened fire, they had guns. Why the SWAT team? Because they had one? As Radley Balko has been saying a lot lately, including in his book Rise of the Warrior Cop, the number of SWAT teams has grown dramatically since the first one was organized in L.A. in the 1960s. He says that in 1975, there were about 500 SWAT units. Which actually seems like a lot. Today, he says, there are thousands. In 1983, 13% of towns between 25,000 and 50,000 people had a SWAT team. Again, that may seem like a lot for towns of less than 50,000, but by 2005, that figure was 80%. The number of SWAT-team raids has also gone up dramatically—from "a few hundred a year" in the 1970s to 50,000 in 2005. Fifty thousand in one year, almost 140 per day, and that was almost a decade ago. Meanwhile, the police are more and more heavily armed, especially with billions in "homeland security" grants available. Even I have pointed out how this money will be claimed whether it's needed or not, although it was more my style to note that Michigan Homeland Security Region 6 had used some of it to buy snow-cone machines. (Which of course were way overpriced.) Of much greater concern is when it's used to buy armored personnel carriers for local police. Are things really that much more dangerous? Nope. Of course there are situations where a SWAT team might be justified. There just aren't enough of them, and so all those people and hardware end up getting used unnecessarily. Balko cites examples of SWAT raids on illegal poker games, bars where underage drinking had been reported, and best of all, a 2006 raid that apprehended a group of Tibetan monks who had overstayed their visas. No monks were harmed, but people (and dogs) do get killed, generally by accident but that makes you just as dead. So it is worth asking why police called in a paramilitary unit to disarm a 90-year-old woman. No matter how pissed off she might have been. Update: Coincidentally today, this. Also in western Michigan, although no snow-cone machines were deployed.